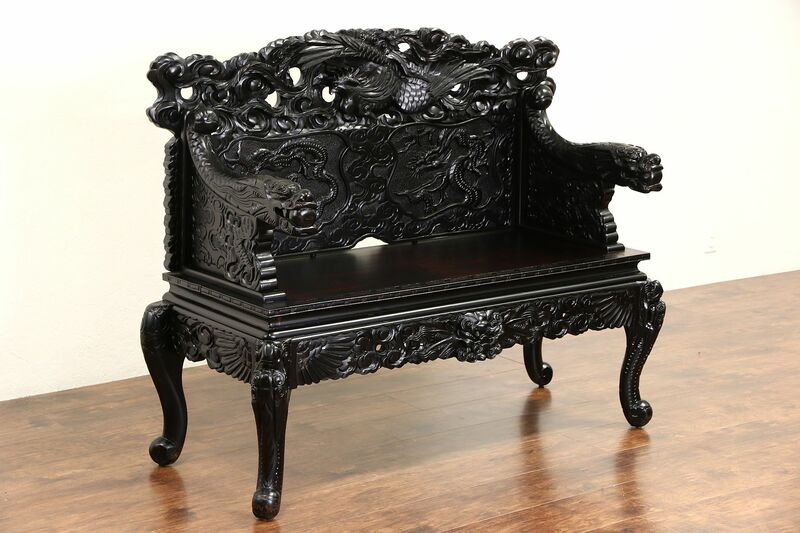 Spectacular three dimensional carved dragons and phoenix birds in solid pine is remarkable on this Meiji period late 1800's antique Asian loveseat, hall bench or settee from Japan. Artistic sculpting is outstanding, the frame is tight and strong. The gleaming dark restored finish is in excellent condition. Measurements are 55" wide, 23" deep, 43 1/2" tall, the seat is 20" high and 18" deep. The matching armchair in photos is priced and sold separately, call or email for availability.